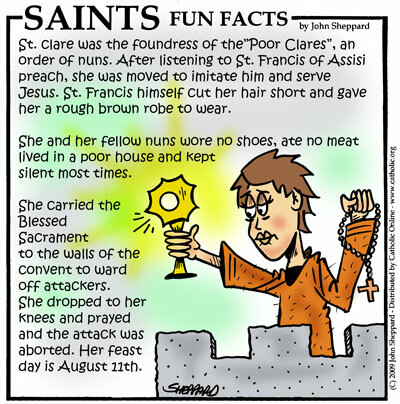 Welcome to SAINTS FUN FACTS! 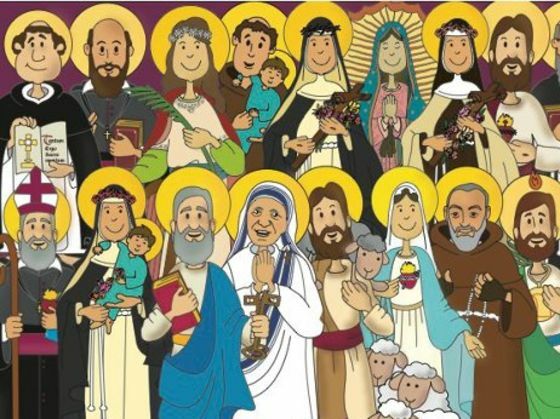 Most saints don’t set out to become a saint, instead they spend their time serving God and helping people in need. Eventually, their good deeds are recognised after their death, and the Pope canonises them (this means the whole Church agrees that they are to be called a saint). Your patron saint is either the saint who shares your name or a saint with whom you feel a special connection– for whatever reason. Even as a child, Clare had a special friendship with Jesus. She loved to pray and to do holy things for him. But it was a young man named Francis that gave the eighteen-year-old Clare a path for her life. Francis had grown up in a wealthy, important family in Assisi (although not as wealthy and important as Clare’s). He had given all of that up and the people of Assisi had thought he was crazy; but over time, as they saw his joy and happiness, and his kindness to the poor and to all creatures, they began to admire him, calling him Poverello, the poor little one. Many of the other young people began to be attracted to his way of life, and before long, a little band of young men had gathered around him. Clare’s father, Count Scifi, had made plans for his beautiful daughter to marry a rich young nobleman. But Clare, who had given her heart completely to Jesus as a young teenager, was determined not to marry. Clare knew her father would not grant her wish easily. So after meeting secretly with Francis about what to do, she and her cousin Pacifica slipped out of the palace in the middle of the night. Count Scifi was so angry when he discovered that Clare had become a nun, he got his best knights and rode to where Clare and Pacifica were staying. Shouting and cursing he stormed into the chapel where Clare was praying. But no matter how he raged, Clare refused to return home with him. “No, Father,” Clare replied calmly. “I have given my allegiance to Christ; Francis only showed me the way.” At that, the exasperated count grabbed Clare to drag her home. But Clare grabbed hold of the altar and would not let go! Another time, robbers were going to attack the home of Clare and her sisters. Clare, who was quite ill, got out of bed, took the Holy Eucharist from the chapel, and went to an open window. There she stood, holding high the Blessed Sacrament. The soldiers coming up the ladder fell backward, dazzled, and fled, leaving the community in peace.